Like many medical terms orthodontics is derived from the Greek word “to straighten teeth”. The main reason to carry out this treatment is to provide a dentition that is healthy, functional and aesthetically pleasing. Problems with crooked and out-of-place teeth are quite common in the UK. A recent study carried out in England and Wales found that around a third of 12 year olds would benefit from some degree of orthodontic treatment. Around 80% of orthodontic treatment in the UK is carried out on children or young adults. Frequently this can cause disruption during important school years. The exam timetable will not change but the correct timing and scheduling of treatment is also crucial. We would advise early consultation, diagnosis and planning as the best way to offset potential problems with the school timetable. Participation in sport and music, particularly wind instruments can also affect the way orthodontic treatment is managed. Our young patients often require gum shields and guards to protect their teeth at this vulnerable time. Dr Justin Evans, our specialist orthodontist not only provides treatment of outstanding quality but is highly adept at managing these “busy” young people in a sympathetic and understanding manner. We treat our patient’s at the most opportune moment for them and will not keep them on unnecessary waiting lists. Private orthodontics allows a wider choice of treatment options which includes tooth coloured brackets, “invisible braces” or lingual which are fixed behind the teeth. Treatment can commence at a time of your choice and there is greater flexibility with appointment times. No referral is needed for both children or adults, and as specialists we can let you know what type of brace would best suit your particular problem. 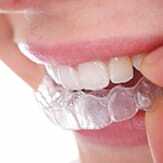 The cost of private orthodontics will vary according to the type of appliance used and the complexity of treatment. We are also able to offer flexible payment options including spreading the cost of treatment over the length of treatment which makes it more affordable for patients. Please feel free to contact the practice for further information on the treatment options available . More details can also be found on our website at themayhill.co.uk or tel 01600 712020. Thank you very much for looking after me so well. All is good with my implants and I feel like a ‘new woman’! My treatment throughout with you was so easy and relatively painless, so thank you for that. I look forward to seeing you again in a few months. Thank you for all your help with my teeth and braces. It will definitely make a huge impact. Thank you so much for your warm welcome and ‘confidence giving appointment’ with you on Friday. I can honestly say that I came away feeling a different person. It is almost 30 years since I felt so at ease with a dental appointment – I cannot thank you all enough for your kindness and care when I was feeling so anxious about coming. I have already recommended you to several people and my husband is also wanting to join your practice. He is sorting out some days and I will be in touch shortly with some suggested dates. We often have people asking for recommendations as they come along to the [doctors] surgery where I work in pain with their mouth and needing help and I will not hesitate in trying to get you as many new patients as possible. I wish you well in your new venture in Monmouth. Thank you once again for your time and attention and will be in again shortly for my next appointment.